Need to make the impression of the year? Now you can with these imprintable paper plates. 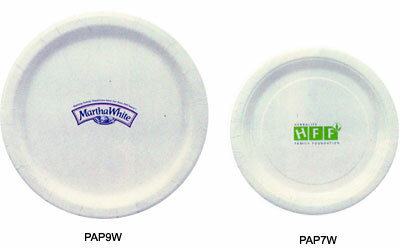 Use our custom-imprinted coated paper plates and you'll remind your guests about your business/organization. We will match any PMS color for your imprint, and your satisfaction is guaranteed. PMS color matching available at no extra charge. For additional information on our Custom Imprinted Paper Plates or our Bar, Nightclub, Restaurant, & Catering Supplies, including Lighted Ice Cubes, please contact us at 1-800-233-0828.